Got a year or two of veggie growing experience under your belt and now looking for a bit more of a challenge? 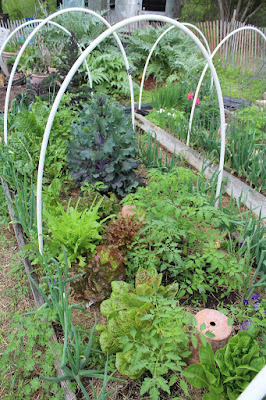 Come to one of my Vegetable Gardening 201 classes at The Natural Gardener. These are the class notes, so if you need a hard copy to bring to class with you, copy the individual url to this blog post and go to PrintFriendly.com. Timing: You already know planting times in Texas are different than the rest of the country. But did you know you can tweak them even more? Gambling a bit by planting things even earlier than the calendar says can really pay off. We do it here at The Natural Gardener occasionally, I do it at home, and many market growers do it regularly. But remember that sometimes, when there's a HARD frost later in the season or a week of 100+ temps later than you think, it's a complete bust. Season Extenders: Things to either warm up or cool down vegetable plants. Frost Cloth – The one you may have already been using. Shade Cloth – You may have already been using this as well. Candle Warmers – Prayer candles in glass, buried partway and lit with a pot over it. Christmas Lights (incandescent) – C7 or C9 type. Cold Frames – “Mini greenhouses.” Usually covered with glass, but sometimes row cover or plastic (sheeting or corrugated plastic panels). Plastic Sheeting – Be sure to get UV resistant. will mature and take their place. Crop Rotation: Rotating planting spots around the garden each season so no type of vegetable is planted in the same spot two years in a row. Cover Cropping: Growing plants for the express purpose of improving the soil. They can be tilled into the soil when they are a few weeks or months old, or allowed to die and decompose in place naturally. If tilled in, allow at least two weeks for decomposition before replanting the bed. Cowpeas – This one’s a legume, so fixes nitrogen. Crimson Clover – Another legume. Australian Winter Pea – Another legume. Hairy Vetch – Still another legume. Photos saved on your phone or computer in dated folders. Blog - combines photos and text, and it's fun! Using "cues" in photos: I planted THESE ..... THIS WAY ........................................... in THIS BED. How pH affects nutrient availability. Desertification - how the summer heat and dryness affects our garden and what to do about it. 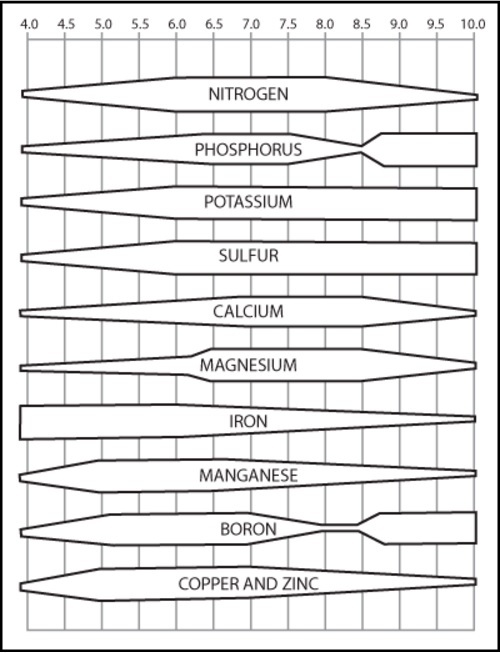 Alkalinity and how it affects soil chemistry, making some nutrients unavailable. The average soil pH in our area that I see on customer's soil tests over and over again is 7.8. Nitrogen - Pale, stunted, yellow plant. Fertilize with a food with a high first number. Iron - Yellow leaves with bright green veins. Give Seaweed with iron or Copperas. Magnesium – Yellow “halo-ed” edges on leaves (width dependent on plant and severity), green centers. 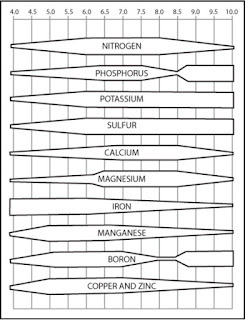 And these deficiencies are, from left, potassium, boron, and nitrogen. Waxing (growing) moon: Time to sow and transplant things that grow above ground. Waning (declining) moon: Time to sow and transplant things that grow below ground. New moon: "Dark of the moon". Dormant period. Kill pests and weeds, turn soil. Garden Experiments: You can learn a lot by experimenting with different products, methods, or varieties. Be sure to do them side-by-side in the same year to evaluate them fairly. If you simply try something one year and something else the next, there may be variables you don't notice that unfairly affect one or the other. For instance, if you use one fertilizer in a year that is mild, then another in a year that got extra hot extra early, any negative effects are likely because of the differences in weather and not the fertilizer's fault. Variety trials - Spend one year using all the extra space in your garden to try growing multiple varieties of the same vegetable. I've found many of my favorite varieties during "The Year of the Bean" or "The Year of the Squash."